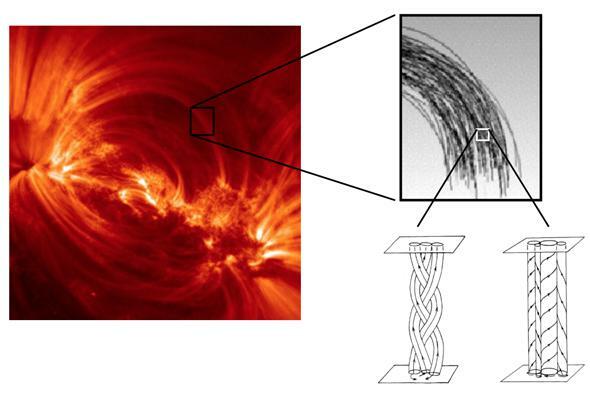 The Sun’s corona: Nanoflares responsible for solar heating. 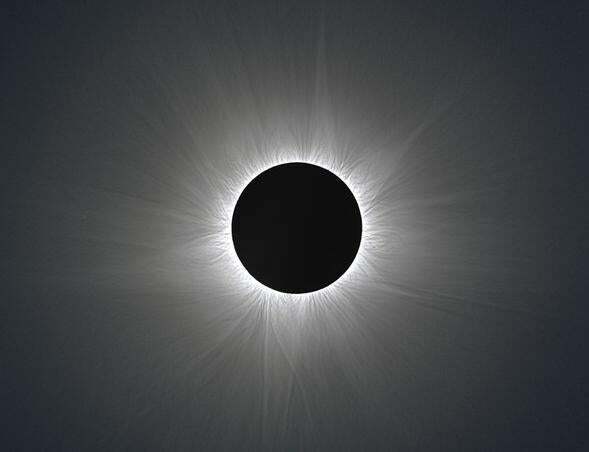 The Sun’s corona is visible during a total solar eclipse, like this one from November 2012. The Sun’s atmosphere—its corona—is far, far hotter than its surface, and this has been a long-standing mystery, baffling astronomers for decades. This week, astronomers announced they have found the smoking gun. Almost literally. Here’s the scoop. The Sun is a huge ball of plasma,* gas so hot that electrons are ripped from their parent atoms. It doesn’t really have a surface, instead just sort of fading away with height. The layer we see is called the photosphere (“sphere of light”), because that’s where the material in the Sun gets thin enough that light can easily fly out. Above this layer is the corona, what you can think of as the Sun’s atmosphere: extremely thin gas. The thing is, while the photosphere is hot, roughly 5,500° C, the corona is freaking hot, 2 million degrees on average. That’s weird. Inside the Sun, the temperature drops as you move out from the center, but that trend reverses, viciously, at the corona. Why is the corona so hot? Astronomers have tried to explain this for years, coming up with lots of mechanisms. But they’re hard to prove or disprove. Observing the corona is difficult; the plasma there is incredibly thin and faint. It’s also so hot it glows at wavelengths of light that don’t penetrate our atmosphere like far ultraviolet and X-rays, so we need space-based observatories to study it (usually; hang on for the important exception). Also, the scale is a tad mind-crushing. The Sun is more than 100 times wider than Earth, 1.4 million kilometers across, and the corona even larger. There’s not much on the large scale that seems to show why the corona should be so hot. A coronal loop (left) is actually made of many magnetic field lines arcing out of the Sun’s surface. If they twist up, the results can be explosive. But there are hints. The Sun has a complex magnetic field, caused by its internal motion, which can generate huge, towering loops above the photosphere. These store unbelievable amounts of energy and when they twist up and tangle, they can snap, releasing that energy as solar flares. These are storms of ridiculous power; a single flare can explode with as much power as 10 billion one megaton H-bombs. These aren’t the source of coronal heating—flares don’t happen very often—but what if big ones are only (so to speak) the tip of the iceberg? What if there are little ones, lots of them, too small to see? These nanoflares, as astronomers dubbed them, could pay the solar coronal heating bill, assuming there were enough of them. But they were maddeningly elusive. Astronomers looked, but never saw any. EUNIS observations of the Sun show nanoflares, blasting energy into the corona 50 megatons at a time. EUNIS breaks up light into its individual colors, allowing astronomers to determine the Sun’s plasma properties, most notably the plasma temperature. The image on the left (teal) shows a small region of the Sun at 10 million degrees Celsius. The middle (pink) is about 1 million degrees, and the right (yellow) a paltry 100,000°—which is still searingly hot, far hotter than the Sun’s surface. The teal image shows the hottest part of the corona, and you can see those finger-like tendrils above center: Those are the nanoflares, or actually many of them, all overlapping. They still happen on a scale too small to see individually, but their collective nature has finally been seen. Each nanoflare sounds small, but they’re still incredible: Each explodes with the energy of a 50 megaton nuclear weapon, equivalent to the most powerful device ever detonated on Earth (the Tsar Bomba; read about that if you want to lose sleep tonight), and there may be millions of those going off each and every second on the Sun’s surface. That’s what heats the corona. Mind you, as powerful as they are they still are dwarfed by the Sun’s normal energy output, which is 100 billion megatons per second. But that heat doesn’t couple with the corona well, which is why the discovery of these nanoflares is so important. And interestingly, the nanoflares are hotter than the corona, too. The physics is complicated, but the astronomers involved in this discovery have models that can help understand this, where the heat transferred to the corona is quickly dissipated. These models, too, are new. While this is a critical step in understanding the corona’s heat, there’s still a problem: What causes the nanoflares? The idea of smaller scale magnetic loop tangles snapping is a good one, but there are others that may contribute as well. 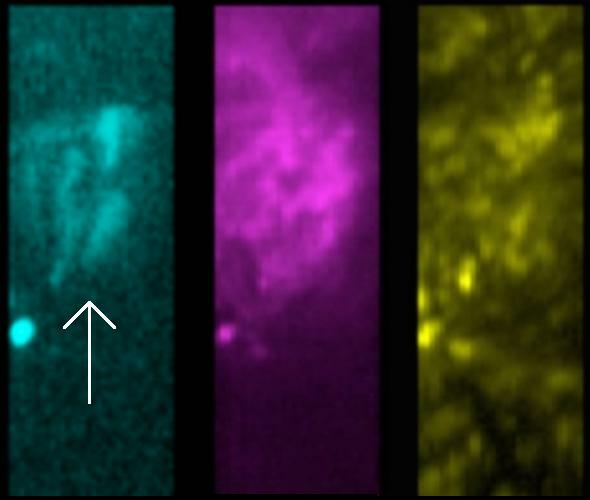 For example, you might expect nanoflares only where magnetic loops are prevalent (where the Sun is active), but observations also show they occur where the Sun is quiet. Clearly, more observations are needed, and more theoretical work to explain them. This new breakthrough was made using several different observatories, including SOHO and the orbiting NuSTAR X-ray observatory (usually used to look at distant black holes, but which is also sensitive enough to see small-scale eruptions on the Sun). Interestingly, EUNIS was launched on a sounding rocket, a suborbital flight (basically, up-and-down) that lasted only 15 minutes! It’s amazing to think that in that short a time, such a long-standing mystery was finally solved. … and a new one started. The cause of the flares may take some time to untangle (haha! Get it?) but we have a solid start now. But of course, that’s part of what makes science so much fun. We solve a mystery, and get to enjoy the satisfaction … and then roll up our sleeves and get back to work. *Some might say it’s a mass of incandescent gas.